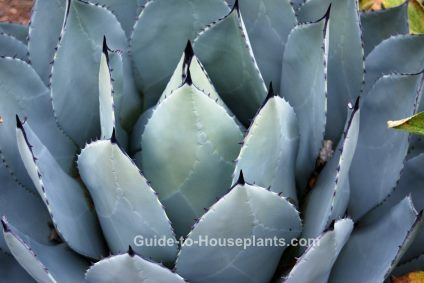 Blue agave plants make good house plants as long as you can provide the sunlight they need. These round succulent plants grow in a rosette of thick, spined leaves. Take care when handling them -- those spines are sharp! It's a good idea to display it where it won't get touched or accidentally bumped. Give these succulents as much light throughout the year as possible. Moving your agave plant outdoors for the summer may be ideal, if it's sheltered from rain. It can withstand high temperatures and around 5 hours of direct sunlight each day. It loves bright light in the winter months, too. However, it won't tolerate cold temperatures, so bring it back in before the nighttime temperatures drop to 50°F/10°C. Keeping agaves indoors year-round is fine. Just put your plant in front of a sunny window. If you move your agave plant outside, make the move to full sun a gradual one. Succulents need to be acclimated to intense light levels. Likewise, when you bring it back indoors in the fall, let it slowly become accustomed to lower light levels. Some people wonder if blue agave is a cactus because it has spines. It's a succulent, but not a cactus. Cacti are distinguishable from other succulents because they have aeroles -- the raised or sunken place where spines or flowers emerge. Blue agave plants are slow-growing, so they rarely need repotted. Repot only every 5 years or so -- just to freshen the soil. Use a wide, heavy pot to prevent toppling. Water: Water thoroughly in spring and summer, allowing the top half of the soil to dry out between waterings. Agaves are drought-tolerant because they store water. Overwatering in the winter is the most common reason for succulents to fail. 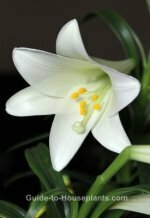 Water sparingly in fall and winter when growth is slower, but do not allow soil to dry out completely. Never water the center of the rosette because this plant will easily rot. Water from the bottom or water the potting mix. Remember to always use room-temperature water when watering your plants. Temperature: Spring to fall, keep warm (70-90°F/21-32°C). In winter, cool (50-60°F/10-16°C). Soil: Well-draining potting mix, such as cactus mix. Or mix 2 parts all-purpose potting mix with 1 part sand. Fertilizer: Feed monthly in spring and summer with a balanced liquid fertilizer diluted by half. Don't feed in fall and winter, when growth is slower. Propagation: Remove offsets that grow at the base of the plant. Cut them off when they are 2-4 in (5-10 cm) high and pot them separately.